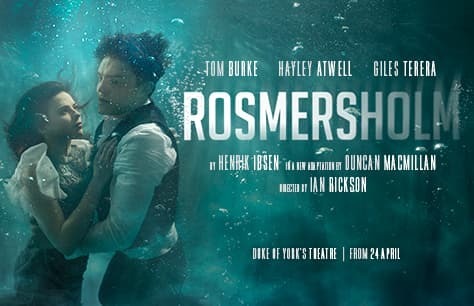 Rosmersholm Tickets on sale now! Widely considered playwright Henrik Ibsen's masterpiece, Rosmersholm is returning to the West End for the first time since its 2008 run at the Almeida Theatre. Considered the pinnacle of his work by many, this seldom seen show is returning to London in a startling adaptation with a stellar cast, making it certain that Rosmersholm tickets will be in high demand. When Rebecca West arrives at Rosmersholm she comes to be a companion to her friend Beate Rosmer whose depression only seems to deepen. When Beate commits suicide, everything is thrown askew. John Rosmer’s beliefs are being challenged and changed. His conservative friendships and ideas are questioned when he decides to support the liberals. Idealism and conservatism are locked in a battle that plays out in homes and in the papers. Rebecca and John struggle with their relationship and their understanding of Beate’s death. As secrets are unearthed and positions made firm, what will come to pass? Widely considered the most important playwright since Shakespeare, Henrik Ibsen was a Norwegian playwright, director and poet. Known as the Father of Realism he has become one of the world's most performed dramatists, second only to the Bard himself. His works are known in every corner of the globe and include classics such as Peer Gynt, Hedda Gabler, The Wild Duck and The Lady from the Sea. A Doll's House is easily his most widely recognized and is also the most performed play in the world. Ibsen was nominated three years consecutively for the Nobel Prize in Literature and his influence on countless playwrights and novels through the years is undeniable. Rosersholm is set to star Hayley Atwell as Rebecca West and Tom Burke playing John Rosmer. Both actors have long and varied careers encompassing stage, screen and film. Hayley Atwell received Olivier Award nominations for her roles in A View from the Bridge which played at the Duke of York's Theatre in 2009 and The Pride in 2013. She was most recently on the stage in 2018 in two productions- the Donmar Warehouse production of Measure for Measure and the Hampstead Theatre production of Dry Powder. Atwell is also known for her work on the television miniseries The Pillars of the Earth and for her portrayal of Peggy Carter in several Marvel films and television series. Tom Burke is perhaps best known for his work on the BBC series The Musketeers, miniseries War & Peace and the recent series Strike. He has played many roles in various productions as an active member of the Royal Shakespeare Company. He appeared in The Cut at the Donmar Warehouse alongside Ian McKellen in 2006 and two years later was directed by his godfather, Alan Rickman, in The Creditors at the same venue. His performance in The Creditors would win him an Ian Charleston Award. The cast also includes Giles Terera who won the 2018 Olivier Award for Best Actor in a Musical for his portrayal of Aaron Burr in the West End production of Hamilton. They will be joined by Lucy Briers (Wolf Hall, The Seagull), Jake Fairbrother (Lady from the Sea, The Maids) and Peter Wight (The Birthday Party, Hamlet). Tickets for Rosmersholm at the Duke of York's Theatre are guaranteed to go quickly. You won't want to miss these stunning actors in Henrik Ibsen's masterwork. Book Rosmersholm tickets now to ensure the best seats at the best prices.